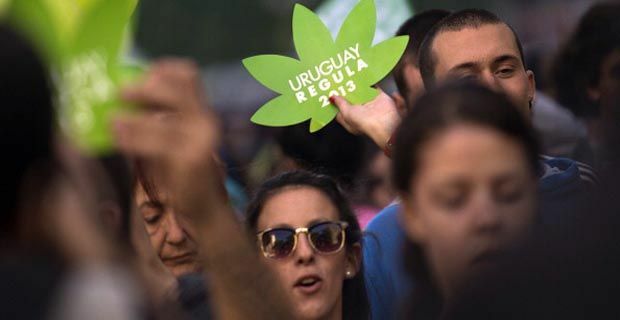 Uruguay has become the first country in the world to legalise cannabis. The Uruguayan parliament passed a bill by 16 votes to 13 that would legalise and regulate its’ production, distribution and sale in the most radical cannabis legislation passed anywhere in the world. Coming into force next year, the law will allow registered users to buy up to 40g of marijuana a month from a chemist, permit registered growers to cultivate up to six plants, and license cannabis clubs for up to 45 members and the potential to grow up to 99 plants. A government run Cannabis institute will be created to regulate all aspects of the newly legal industry from setting the price to monitoring both the implementation and the results of the law. Uruguay has long been tolerant of cannabis, effectively decriminalising its personal use, but with production and sale remaining illegal, criminal networks controlled the trade. President José Mujica is determined to break the power of those networks through legalisation, and with Latin America ravaged by the effects of drug trafficking, especially the cocaine trade, it is difficult not to see the sense in this strategy.